It seems that in this world, there is a silent battle entitled “can you top this?”. It may be houses, cars and just about everything imaginable under the sun. This time, Alexander Amosu jumped the gun and took the high-road, or should we say the highest road possible. What are we talking about? How about the most Expensive iPhone 6 at £1.7 million. Yep, that’s not a typo, it’s an iPhone priced at one million and 700 hundred thousand pounds. Alexander Amosu, a known luxury designer, maybe just insane or a pure product branding genius. In fact, most people won’t be surprised if he’s both. It’s known that the new iPhone has just been released. The luxury designer took the opportunity to piggyback on the iPhone release with his two extravagant creations. Amosu’s premium iPhones actually come in to two designs. The first one is an iPhone 6 that comes with a cover made of 24-karat Rose and Yellow gold. However, it’s the second design that bagged “the most expensive iPhone 6” title to date. The design is just like the gold plated version, but comes with a crazy four side bezel and a diamond studded back. The first version is officially named as “Amosu 24ct Gold iPhone 6”. This iPhone is already available for pre-order at Alexander Amosu’s official website. It’s currently priced at £ 2,399. Buyers have the option of having their company name or name on the back panel part of the designer iPhone 6. On the website, anyone can purchase a leather cover for the iPhone 6 priced at £150, but it comes free for anyone who pre-order the designed iPhone before September 12. However, it’s the second design that got the media’s attention. The official name is the “Call of Diamond iPhone 6”. This design has a similar gold plating of the first design, but instead of a 24-karat gold, an 18-karat gold is used. The impressive addition is the 6,127 VVSI diamonds that are embedded on the back of the handset. The highlight is the even more impressive 51.29-carat diamond that is cut exactly the shape of the Apple logo. It takes two months to create this luxury iPhone 6. 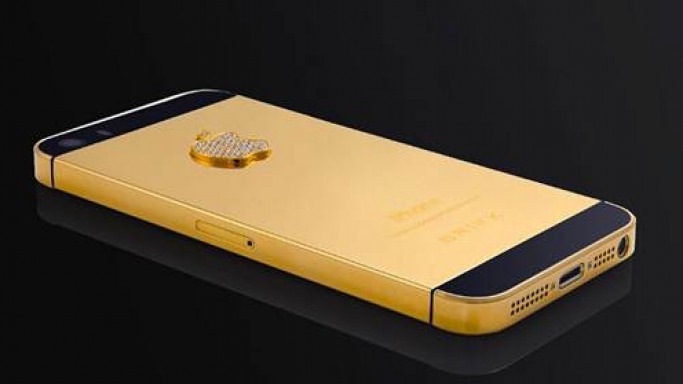 The current price of this luxurious diamond-studded iPhone 6 is set at £ 1.7 million. Alexander Amosu is a brand known for its luxury items, but this is the first time the brand has created a luxury version of the iPhone. However, it’s not the first time a company has attempted to make premium versions of the iPhone. A company known as Falcon has already created a few luxury designs for the iPhone 6. Some of their designs also incorporate diamonds into the handset design. Unlike the £ 1.7 million iPhone 6 by Amos, Falcon’s flagship design consists of one big diamond placed in between the “iPhone” engraving and Apple logo. The pricing is based on the design and materials used, which comes in three categories – Rose Gold, 24k Gold and Platinum. The Falcon’s iPhone designs may not be as insane or luxurious as Amosu’s, but it has a more practical approach. C’mon, how many people you know that has £ 1.7 millions lying around to be used for purchasing a hyper-luxurious smartphone. But then again, this£ 1.7 million smartphone was not intended for the average mortals anyway. Pearls - The Most Expensive of the Lot!